If I wasn’t knitting, I would probably be cooking or baking. I sometimes watch the Food Network (Hi Alton! Call me! ), and often spend a chunk of time on the weekend in the kitchen the same way I would put in a weekend warrior attempt at finishing a piece of knitting. I am generally a big fan of making stuff, and the triumph of getting to actually wear, use, or eat the things I make is sort of the side bonus. The downside to cooking or baking is that it’s really hard to do that while you’re sitting on a subway or at a streetcorner cafe. But there are few knitting projects that result in chocolate cakes or loaves of bread, so I think the benefits are probably on par for each. So, a month ago when there was a lull in the knitting books that were coming through the publishing world, I asked to look at a couple of cookbooks instead, and Random House happily obliged me. This one is from popular television chef Giada DiLaurentis, appropriately named Giada’s Kitchen. 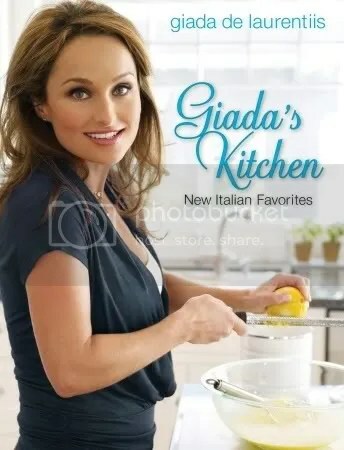 Now, all skepticism aside about how Giada actually manages to eat all the food she makes and still remain the cute pocket-sized television personality that she is, I have to give this book major props. I’m the sort of person who has flirted with taking Italian cooking seriously enough to have actually made my own pasta (and without a pasta maker, too…and you thought knitting was rough on the hands, HAH), attempted those almond-egg-white cakes that never seem to rise properly, and generally started to wonder what the big deal was about pasta because it is everywhere and seems kind of boring when you make it yourself. Last night I tried two recipes from this collection; the White Bean and Garlic soup and Linguine with Green Beans and Ricotta, with some garlicy Calabrese bread on the side. It took less than an hour to get both dishes on the table from start to finish, and it is a crying shame only two of us were eating them because it was so good. I was left with a pleasant combination of flavours in my mouth afterwards, not to mention a nice fridge full of leftovers to get me through a few lunches this week. Giada’s recipes are, I have to say, an excellent set of everyday recipes. Most of the ingredients she uses are familar and will not have you scouring specialty markets (Naked Chef, I’m looking at you), and they are simple enough not to take up more than a page each of the book (Martha Stewart, I’m looking at YOU). There is also enough variety in here to take you through an entire multi-course meal if you want, right from cocktails to dessert, and also uses a lot of vegetarian recipes as well as meat courses. I’m flirting with the Appetizer Red Pepper Cheesecake and the Lamb Ragu for next attempts, I think. Thankfully a lot of her recipes are available on the Food Network website (as the recipe I link to above), so you can try some before committing to the whole book. For me though, I don’t think this book is going to gather a whole lot of dust any time soon. Next up in reviewing over the next couple of months: The Canadian Living Baking Book, Shear Spirit, and Mason-Dixon: Knitting Outside the Lines. Can’t wait! That sounds like a marvelous book; I’m definitely going to take a look. (And we L-O-V-E Alton, he’s really nice in person, too!) Thanks for the review! On my way to the recipe link, and Thank YOU! The linguini looks and sounds yummy. Thanks for including the link. I think I know what’s for dinner! Man, whenever I see mouth-watering food I wish I liked cooking. I love the idea of the knitting-and-cooking weekend warrior! For some reason Giada turns me off, while the rest of my family just loves her. I think part of it is that many of her recipes are so rich, but she’s so slim. There seems to be a disconnect. thanks for the link. recipes sound great! Thanks for the review. I also love perusing the Food Network site, but Giada is not someone I look for usually. I will definitely check out the book after seeing your wonderful dish. Thanks so much for the 4-1-1 on Giada’s cookbook. I enjoy watching her show on the Food Network and I just love the way she takes a few simple ingredients and can somehow turn them into a gourmet dish. I’ll have to see if I can pick up one for myself. The Linguini looked so mouthwatering. That book sounds really good – I love Italian food, and I’ve also made my own pasta (although I cheated and used a pasta machine). Not recently though. I wonder if it will be available in the UK? We make our own pasta all the time! (We’re sort of DIYers when it comes to cooking around here). It’s totally worth the effort. And even though we have a machine, it’s really not that much easier than just rolling out the dough by hand. I love cooking, baking and the Food Network too. Thanks for the review. I have a couple of her other books, but haven’t thumbed through this one yet. I’ll have to take a look next time I’m in the bookstore. 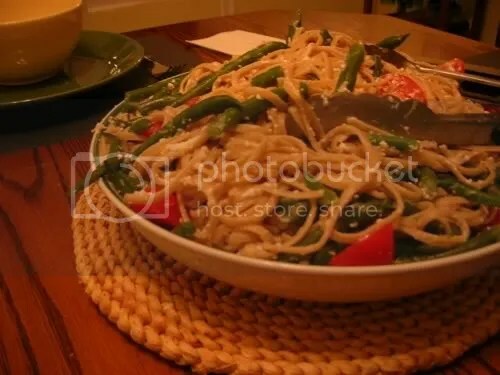 That pasta looks delish!